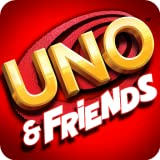 UNO & Friends - The Classic Card Game Goes Social! Challenge millions of UNOTM fans worldwide! New leaderboards let you see how you stack up with weekly contests to win rewards! Customize your UNOTM game with backgrounds, card deck designs & special effects! Use Boosts & Super Boosts to mix up your strategy!